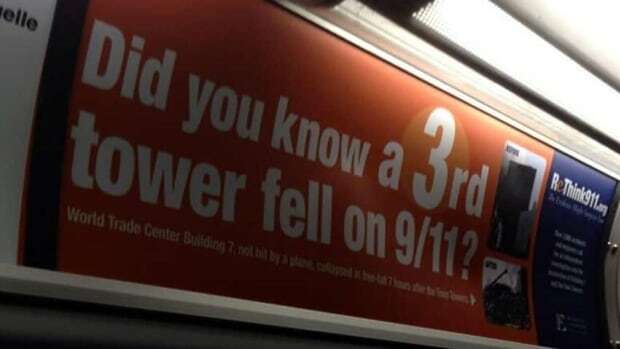 The group behind an ad campaign questioning the official explanation of 9/11, which is running on OC Transpo buses, says its message should be protected as free speech. The group called Architects & Engineers for 9/11 Truth have launched a global ad campaign called "ReThink911," which is running in other cities including New York and Toronto. The campaign takes aim at the U.S. government's explanation that World Trade Centre 7 — the "third tower" — fell as the result of fire. The theory is part of the group's larger beliefs that the collapse of the World Trade Center towers on Sept. 11, 2001, was not the result of a terrorist attack but part of a vast conspiracy and cover-up within the U.S. government. Carleton University student Andres Acero first spotted one of the group's ads aboard an OC Transpo bus earlier this week. A volunteer with a campus first responders group, Acero said he thinks the ads are disrespectful to the first responders who lost their lives during the 9/11 terrorist attack. "Take it down. There should be no reason why it's on there. Just take it down. Maybe send an apology to the families of Sept. 11 and all the victims," said Acero. Transit commission chairwoman Diane Deans agreed, saying while it was a "difficult challenge" to balance the constitutional right to free speech with community acceptability, she thought the ads were "insensitive." Deans said she would ask for a review of OC Transpo's ad policies at the next transit commission meeting. Architects & Engineers for 9/11 Truth responded on Thursday, taking issue with the notion they were being insensitive to run the campaign. They also said their campaign is sponsored by a group representing more than 100 victims' family members. "To Councillor Deans and to all who question our sensitivity and legal right to run the ReThink911 ads, we would like to make clear: the ReThink911 coalition includes 9/11 victims’ family members who want nothing more than an accurate and unbiased accounting of the death of their loved ones," the group said in a letter published on their website. Mayor Jim Watson also weighed in on Thursday, calling the ads "disrespectful" but saying he wouldn't ask to have them removed. "At the end of the day they met the Advertising Standards Council's standards and they are allowed on the buses," said Watson. "The transit comission can certainly review those and I encourage them to do so. We disagree with the message but you know, free speech is an important principle in our society." Times Square Billboard Is Here – Make This Historic Image Go Viral! Jim Watson is the Mayor of Ottawa, Ontario, Canada. He moved to Ottawa to attend Carleton University and graduated in 1983 with a Bachelor of Public Affairs degree from the School of Journalism and Communications.Ottawa is the capital of Canada, and the fourth largest city in the country. Diane Deans was first elected to Ottawa City Council in November 1994, and in October 2010 Diane was re-elected to her sixth consecutive term. She proudly represents over 48,000 south-end residents who live in Gloucester-Southgate Ward. Orangutan. on Mon, 09/16/2013 - 12:15pm. I don't like this idea of publishing their contact information. It's not going to help our cause to have a bunch of angry truthers letter-bombing them. Find one or two reps from the campaign who can lay out the facts to them in a calm, rational manner. jnelson on Tue, 09/17/2013 - 10:53am. It's all public information and I'd rather have too many people contact them, than not enough. But I understand your concerns. It's pros vs. cons I suppose, ideally no one would have to contact them about the truth of 9/11. I just hate to see everyone waiting or hoping for someone else to do it, when we can just do it ourselves, especially if it never ends up getting done. Orangutan. on Tue, 09/17/2013 - 12:23pm. So long as people are courteous, I think writing in is the right idea. If they see we're decent people it's going to help our cause all the more. Emailed Diane Deans and repeated to her that Richard Gage and AE911Truth have the deepest respect for the victims of 9/11, and that victims have been instrumental in the investigations and campaigns. Sent her some information about selected papers from this site http://911inacademia.com/journal-papers/ to let her know that, in addition to WTC 7, there are unresolved issues being discussed in mainstream academic journals. Satyakaama on Tue, 09/17/2013 - 7:00pm. My email to Diane Deans bounced back in the cyber-ether (Mailer Daemon). I'm in favor of people being free to contact public officials, but the idea of using reps might also be a good one. It gives a strong focus to the message. Satyakaama on Wed, 09/18/2013 - 12:15pm. No mention on blogger that Richard Gage and others were at a 9/11 Truth conference this past weekend in Pentagon City, VA. It was a successful conference, sorry ya'll didn't find it interesting enough to "pay attention" to. taylor mcknight on Mon, 09/16/2013 - 2:53pm. 911blogger is user submitted news. The "creat blog" link is on the lower left. jkeogh on Mon, 09/16/2013 - 6:15pm. I'll take that over 'no press' with fewer people getting the message. TomT on Mon, 09/16/2013 - 10:46pm. "Send an apology to the families..." ?!? Who does Andres Acero think he is? Why does he think he can speak for 9/11 families? He should be thanking us. But he's a moron so he doesn't know any better. He certainly is not speaking for 9/11 families. jnelson on Tue, 09/17/2013 - 10:46am. If you'd like to contact him and ask him these questions personally let me know and I will lead you to his publicly available email address. I'd prefer you leave out the personal attacks though if you choose to do so. Orangutan. on Tue, 09/17/2013 - 12:31pm. is based on unresearched assumption, it is a reaction to the unresearched assumptions about 9/11 truth and justice expressed by people like Andres Acero - assumptions which serve to automatically, without thinking, marginalize and trivialize the experiences and concerns of the people for whom Acero thinks he speaks. Sometimes strong language is needed to help people understand they're on the wrong side of understanding. It's no longer acceptable, imo, to turn the other cheek to disrespectful comments about 9/11 truth and justice. Such commentators need to be rebuked sharply. But not in an e-mail from some stranger out of the ethers. jnelson on Tue, 09/17/2013 - 10:59pm. I reacted sharply negative to a friend who hinted something might be up with 09/11/01. It's what people do. Generally we do not understand defense mechanisms while employing them. jkeogh on Wed, 09/18/2013 - 1:04am. "My experience is that I cant tell someone what I think the truth is and expect positive results. I can only present information that may excite them to discover the connections.... A person who discovers something is more likely to become active than a person who is told they were wrong about something." In the case of willful ignorance, a sharp word is simply giving someone a taste of their own medicine, and can sometimes shock them into considering that not only might they not be as right as they think they are, but that they also can't keep dismissing the views of others from their own tenuous position. In this case, the facts were staring this person right in the face, and he still says, "take it down. It offends me." Sometimes there's only one response to that. Of course, I make the mistake of seeing Acero's response as one example in a continuum of response to 9/11 inquiry rather than as a single response from one who may be brand new to the information. And this is what requires patience and generosity -- qualities I am clearly lacking at the moment. jnelson on Wed, 09/18/2013 - 7:21am.